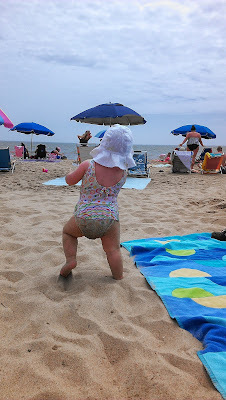 Yesterday we returned from a week with my family in Rehoboth Beach, Del. Twenty-three of us -- Brad and me, the girls, my parents, three sisters, a brother, two brothers-in-law, and various nieces, nephews, and friends -- crammed into a nine-bedroom house on a tree-lined street a few blocks from the beach. It was a good week. It only rained once, Lily saw wild dolphins for the first time ever, Jovie discovered the joy of putting sand in a bucket, and I got some much-needed quality time with my family. I brought my laptop along thinking I would squeeze in some work at one point or another -- but (surprise, surprise) didn't feel much like turning it on. The sand is everywhere -- the floor, carpets, couch and sheets. On your feet, of course, but also in your bra and hair and ears. Through the week it partners with the sweat from the demon sun and wears down your old skin -- commanding you to give up the neatness, the order and the crispness of life back home and succumb to the shore and a different version of clean. And once you give up -- once you surrender to living scrubbed brown and peeling and you sink into the old sticky cushions of that well-loved couch and agree that the heavy air being knocked around by the old ceiling fan provides just enough relief from the wool blanket day -- then vacation can begin. Everything in this beach house speaks of that calming calamity. The clatter of doors opening and closing, in and out and in and out. You're never alone. And the layers of residents -- decades of past vacations curated in the kitchen drawers with mismatched spatulas and forgotten pot holders and bookshelves where last year's beach reads and the year's before that is waiting -- hopeful for another go around. This old and wrinkled house is our hostess. Generous with all of her collections -- rusting bikes, cracked bowls and battered beach toys. Everything decades past it's usefulness but the gesture is still sweet and anyway you take comfort in her hospitality. That giant dining room table that fits almost everyone or the hammock where the boys pile on screaming and giggling unaware of the mosquitoes until it's too late. The beds are old, but large enough for mom, dad and the little ones to crawl in and read stories and talk about the dolphins and the sand castles. The house has tides, too. High tide is at 8:30 when it wakes up and the babies chase each other up and down the stairs and the grownups bumble about the kitchen in search of coffee and toast. It goes down late morning and into the afternoon as everyone parades to the beach. So, so quiet, but there's always at least one person around, opening and closing doors. Keeping its heart pumping, sweeping sand off the floors. Tide goes up again at night -- dinner, dishes, fireflies, bedtime protests, and then of course down again when it's late and everyone asleep. We've all found our favorite places -- pockets to retreat to when the clamoring overwhelms. One sister to the laundry room -- steaming and smelly but secluded and the last place anyone will check. I choose the sunroom, in the oppressive heat it's quiet, save for the boys always yelling outside and the radio blasting country music next door. And an owl, disgruntled by all the commotion when he's just trying to sleep. The smokers go to the front stoop. The teenagers, the basement. We've all staked a claim and even then with 23 people you'll be interrupted. The 7-year-old will ask you about your book and make sure you bent the page in the right spot. He'll find the doughnuts stashed on the washing machine and take the last chocolate-chocolate one without asking his mom. Your don't say anything because it's vacation. He'll tell you the proper way to scare of zombies is with an air horn and that when his dad's sleeping he and his little brother like to sneak cookies from the kitchen. Adn then he'll point out that this is life. What's happening right now is life. The child philosopher. And he's right about it, too. The crescendo of noises, in and and out and in and out as three generations tolerate and embrace each other with the desperate hope that they'll have just five minutes of something sweet or funny or tender to squirrel away until the next time. The 7-year-old hears a song on the radio and sings the chorus squinting his eyes for affect. He grabs the empty doughnut box -- his lips lined with chocolate glaze -- and heads inside to destroy the evidence. And you enjoy another minute of silence before following him inside, looking for company. Leaving behind a trail of sandy footprints. Is it OK to talk about gun control yet?